Allen Williams has a famous backyard. 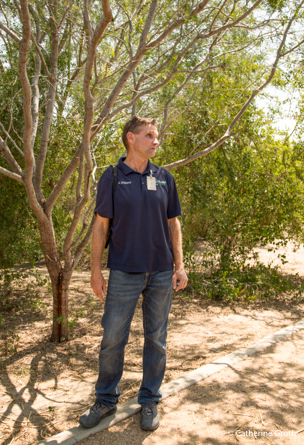 He converted his 2.5 acres in Pharr to a native landscape by planting local trees, shrubs and flowers and installing water features — all to attract birds. The birds definitely showed up. Within a year, a rare blue mockingbird appeared, an event that caused a stir in Valley birding circles. A couple of years later, a black-headed nightingale-thrush arrived, marking the first documented U.S. appearance of the bird. More rarities showed up, and bird watchers from around the country showed up, too, sometimes getting off the plane and rushing to Williams’ property to see whichever avian attraction was there. Now Williams has grander plans for his habitat crusade in the Valley, where 95 percent of the native habitat has been cleared away. As landscape wildlife habitat specialist for the Pharr-San Juan-Alamo Independent School District since 2013, he has been busy helping schools install native plant habitats not only as a water- and wildlife-friendly way to landscape but also as a way to incorporate nature and science for kids. 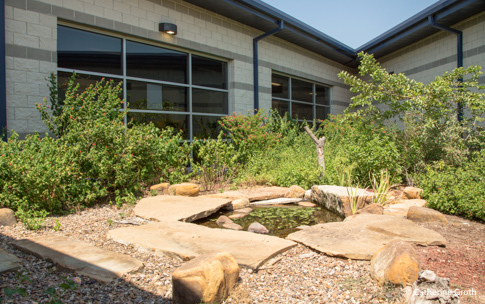 The school district has committed to installing native habitat at all its elementary schools and using the native plants and animals as a hands-on way to teach biology, botany and environmental stewardship. Williams says he was surprised how few students appreciated the unique plant and bird life of the Valley. He wants them to know anacua trees, great kiskadees and indigo snakes. line of students and asks, “Who’s seen a hummingbird today?” Several students raise their hands. Palmer science lab teacher Yanel Leos says the outdoor lessons are paying off. Building on this success, regional school officials created the Lower Rio Grande Valley Learning Landscape Collaborative, with the Harlingen, McAllen and Donna school districts also committed to building native plant school habitats and using them for school science lessons. The collaborative caught the eye of former first lady Laura Bush’s Texan by Nature organization, which selected the initiative for its Conservation Wrangler Program. Not a bad outcome for a guy who just wanted to see some birds.